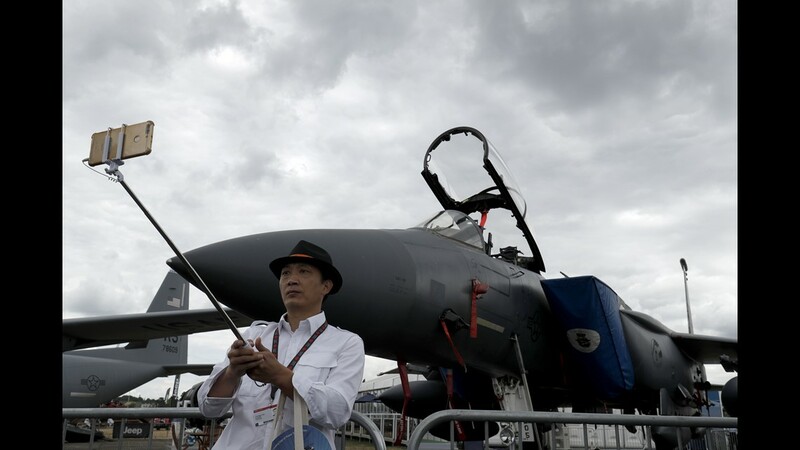 A visitor takes a selfie photograph in front of a Boeing F15E MultiRoll fighter aircraft displayed at the Farnborough Airshow on July 18, 2018. 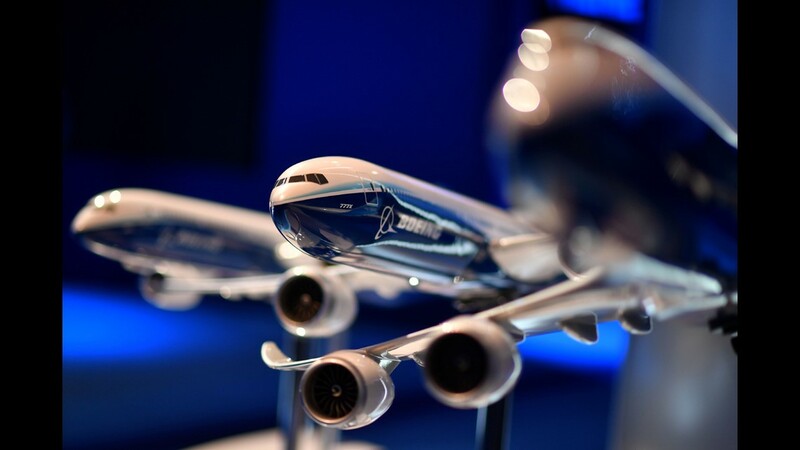 A model of a Boeing 777X aircraft is displayed during the Farnborough Airshow on July 17, 2018. 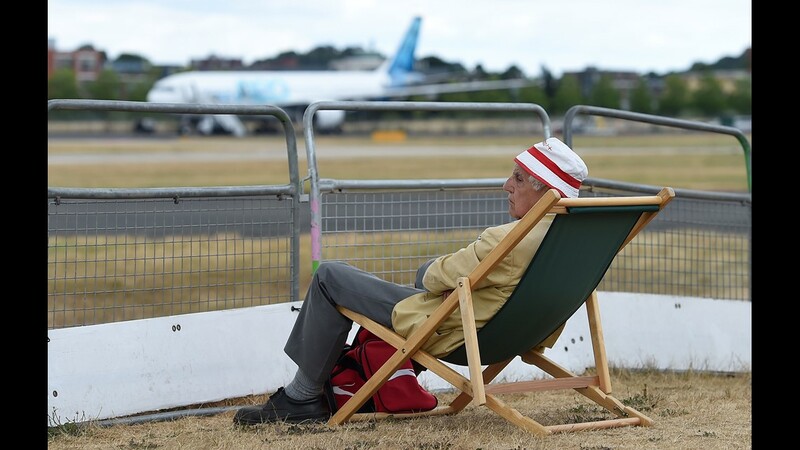 An aircraft enthusiast has a deck chair set up to watch the flight shows of various planes at the Farnborough International Airshow on July 17, 2018. 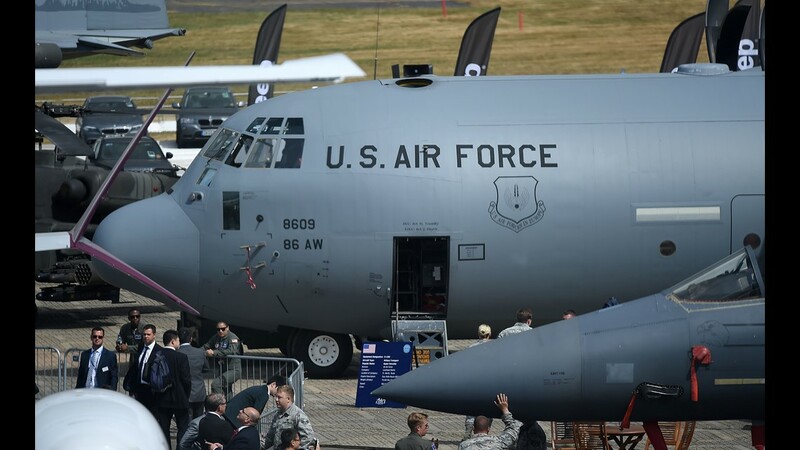 Commercial airliners are on display at the Farnborough International AirshowA U.S. Air Force C-130J Super Hercules military transport plane on display at the Farnborough International Airshow on July 17, 2018. 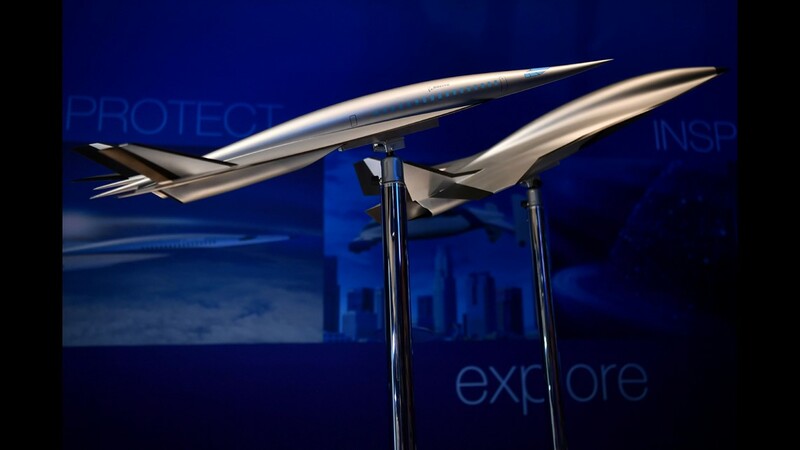 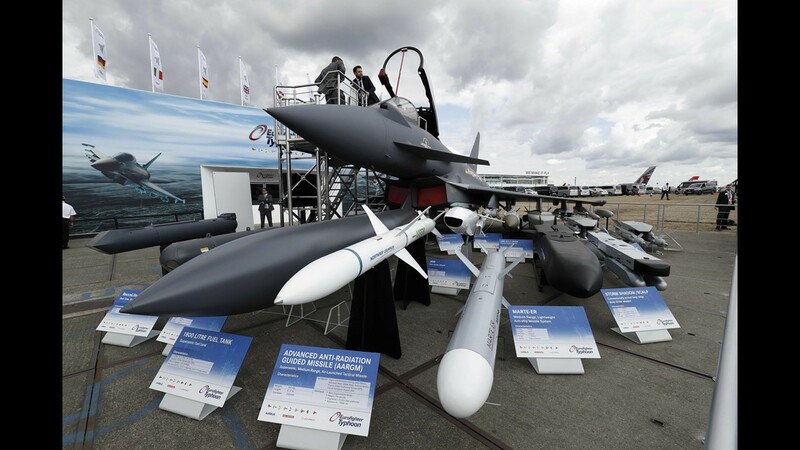 Models of a Boeing Hypersonic concept plane are displayed during the Farnborough Airshow on July 17, 2018. 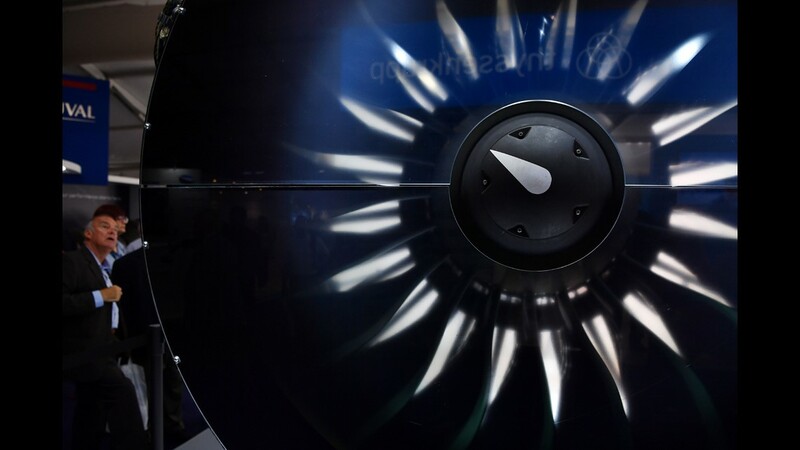 Visitors look at a Pratt and Whitney PW1000G engine during the Farnborough Airshow on July 17, 2018. 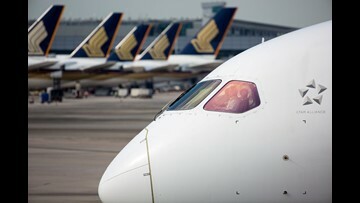 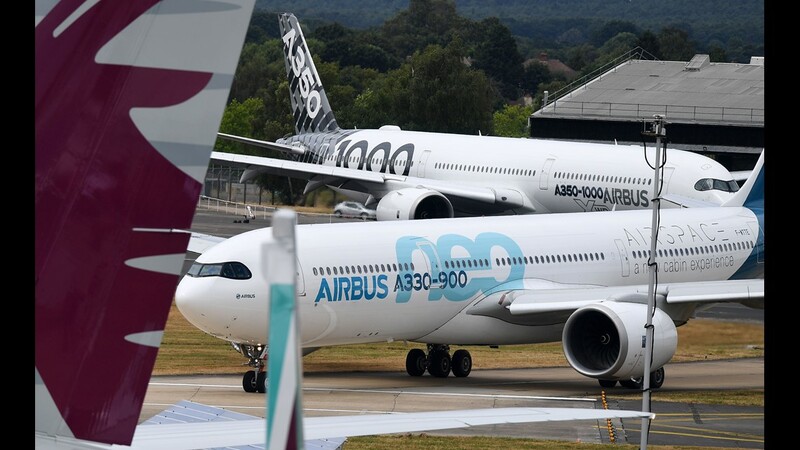 An Airbus A330-900 neo (front) and an A350-1000 XWB (behind) taxi to the runway at the Farnborough International Airshow on July 17, 2018. 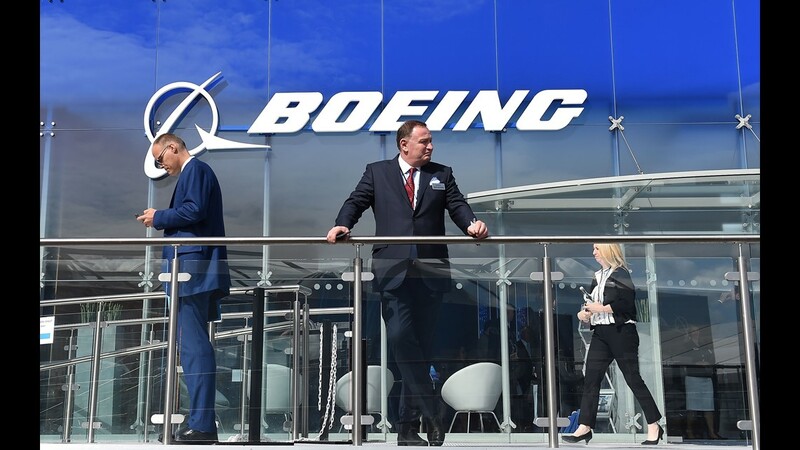 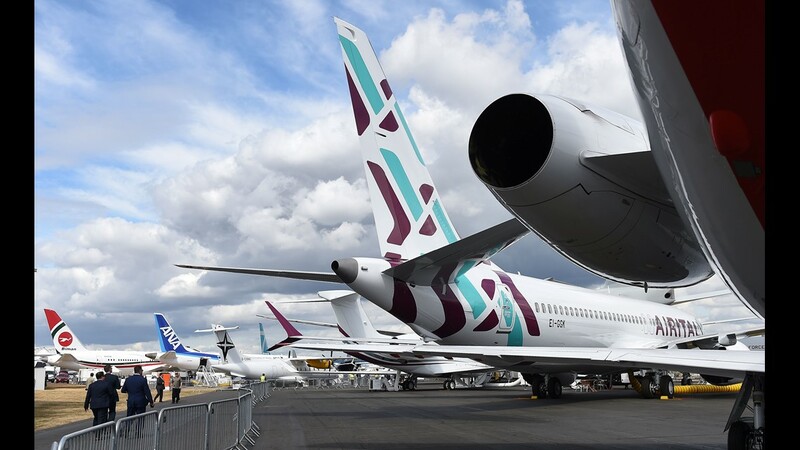 Visitors are seen outside the Boeing Hall at the Farnborough International Airshow on July 17, 2018. 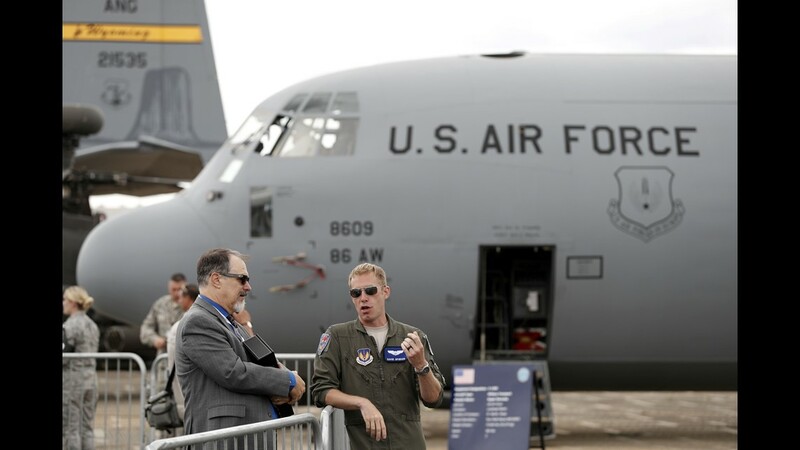 A U.S. Air Force C-130J Super Hercules military transport plane is on display at the Farnborough International Airshow on July 17, 2018. 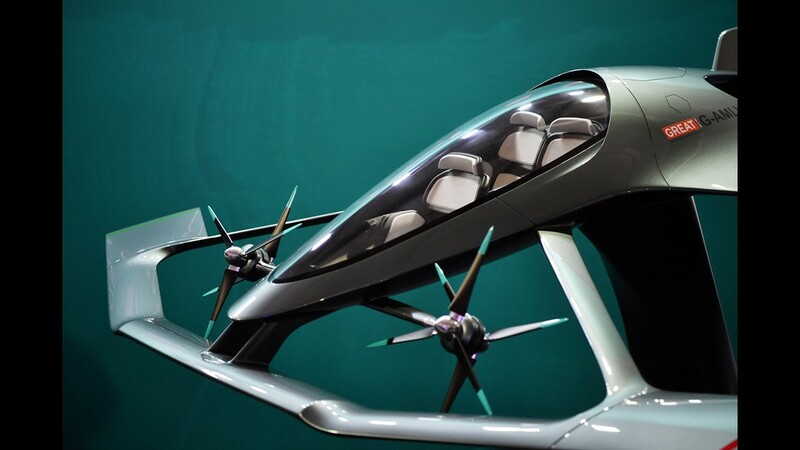 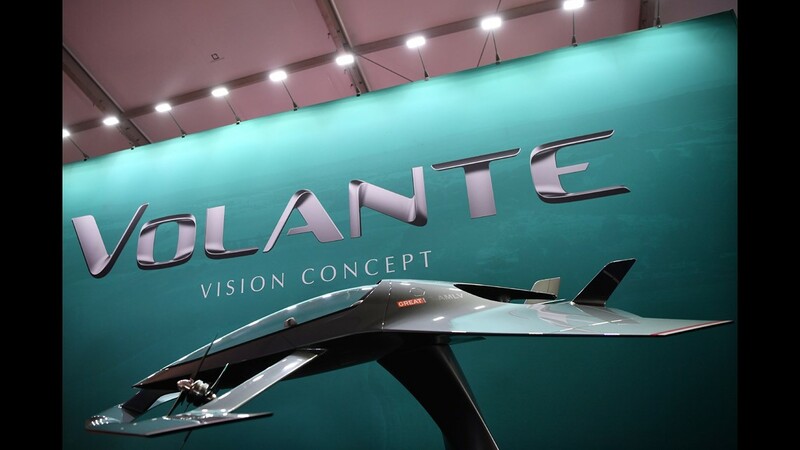 A model of the Aston Martin Vision Volante Concept aircraft is displayed at the Farnborough Airshow on July 17, 2018. 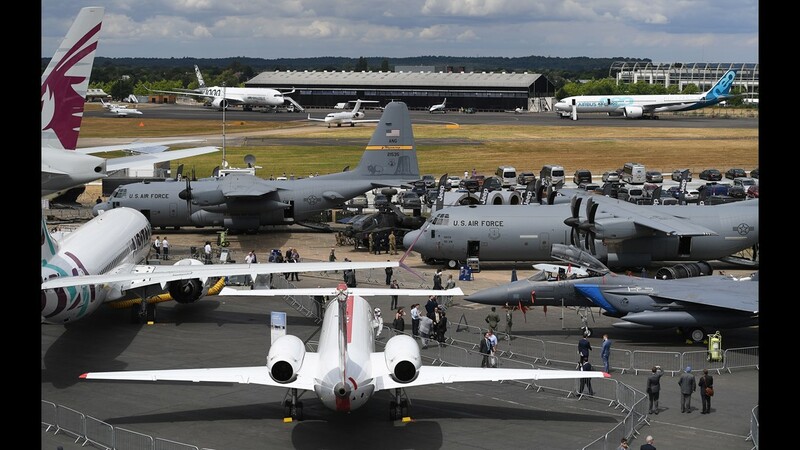 A general view of the outdoor display grounds at the Farnborough International Airshow A U.S. Air Force C-130J Super Hercules military transport plane on display at the Farnborough International Airshow on July 17, 2018. 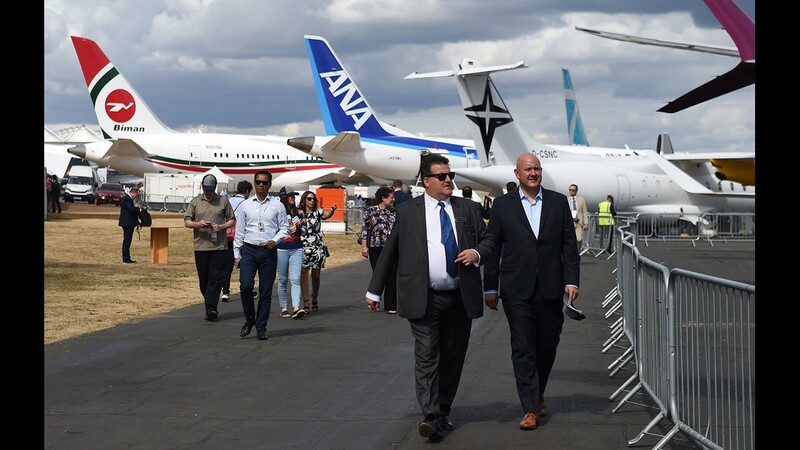 Visitors walk in front of commercial airliners on display at the Farnborough International Airshowon July 17, 2018. 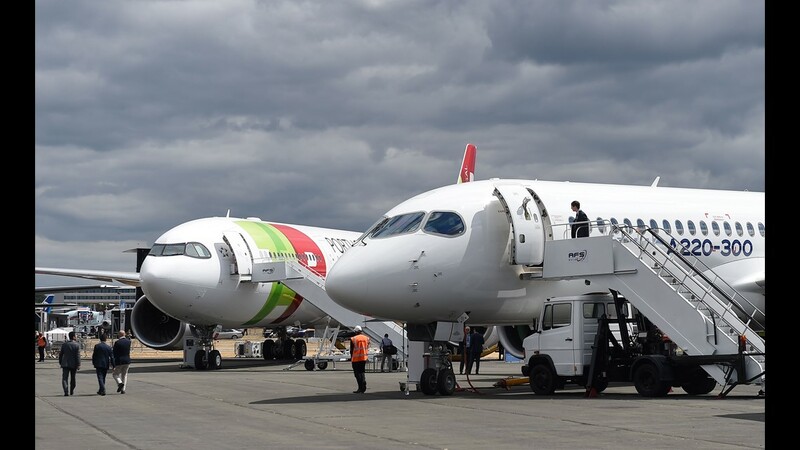 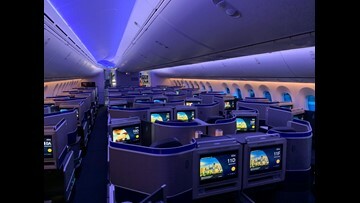 Airbus aircraft are on display at the Farnborough International Airshow on July 17, 2018. 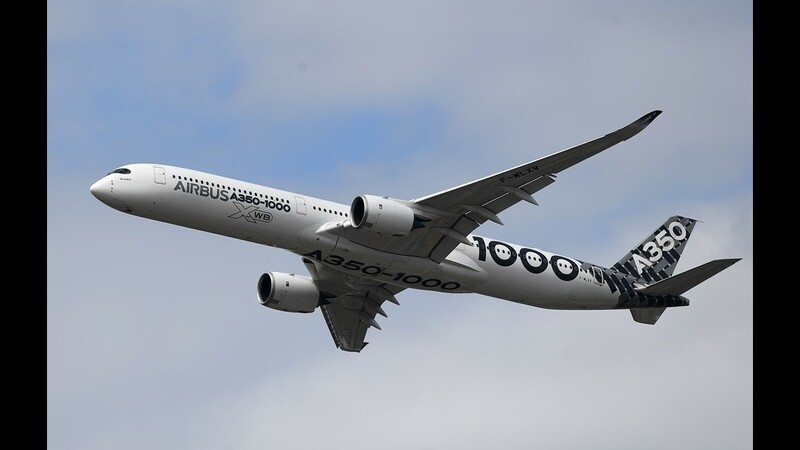 An Airbus A350-1000 XWB flies during a display flight at the Farnborough International Airshow on July 17, 2018. 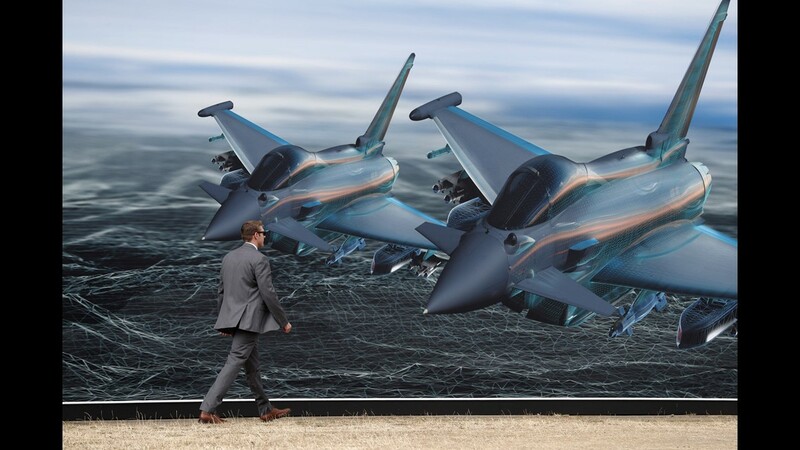 A man climbs out of the cockpit of a Eurofighter Typhoon aircraft at the BAE Systems exhibition space during the Farnborough Airshow on July 18, 2018. 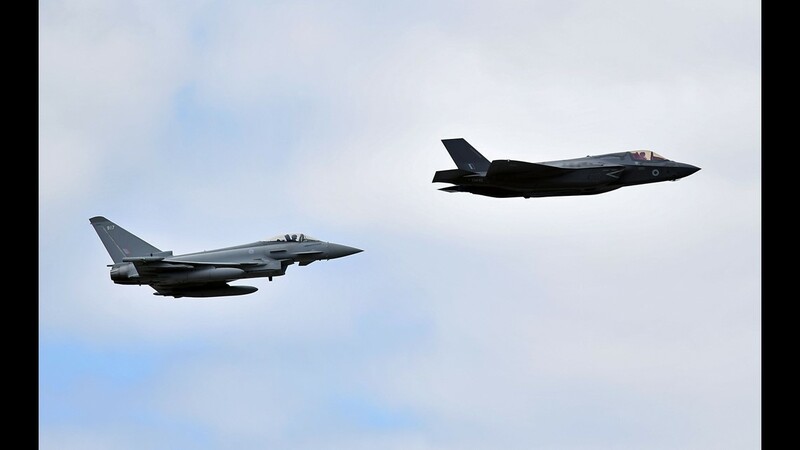 A British Royal Air Force (RAF) Lockheed Martin F-35 Lightning II (right) and a Eurofighter Typhoon aircraft perform a fly-past during the Farnborough Airshow on July 17, 2018. 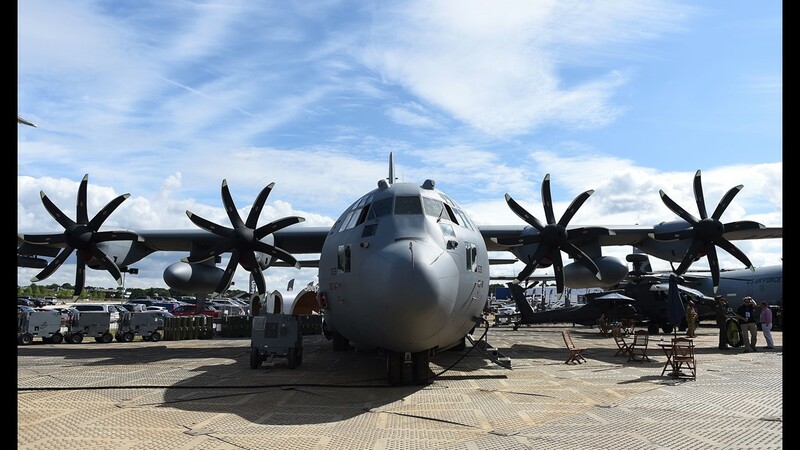 A U.S. Air Force C-130J Super Hercules military transport plane on display at the Farnborough International Airshow on July 17, 2018. 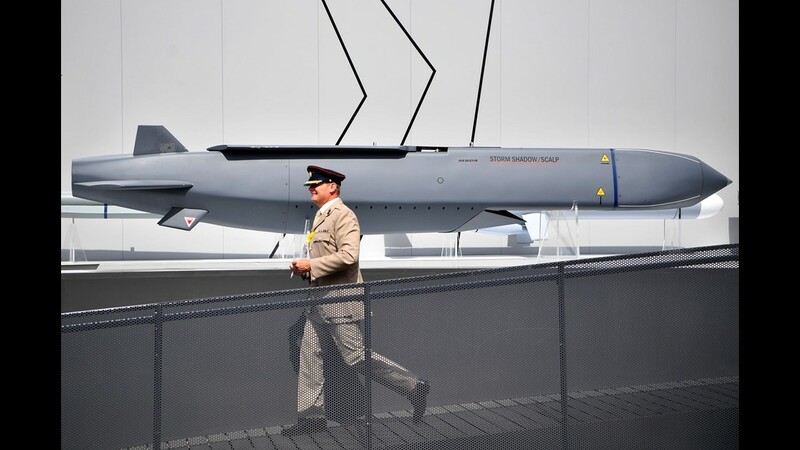 A member of the military walks past a MBDA Storm Shadow/Scalp missile at the Farnborough Airshow on July 17, 2018. 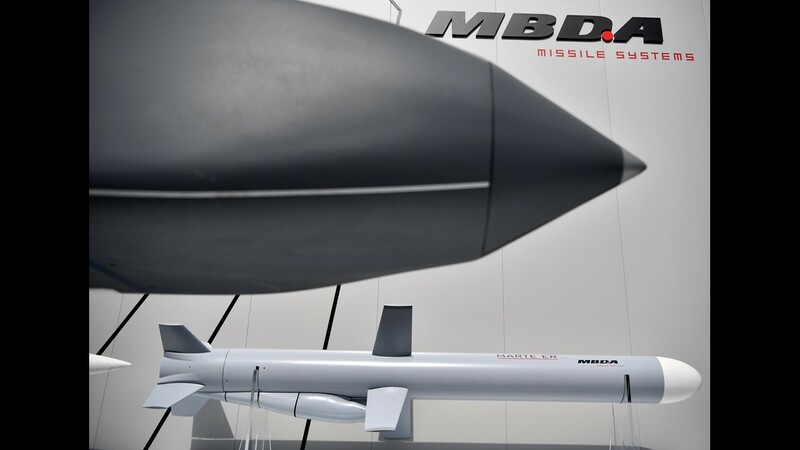 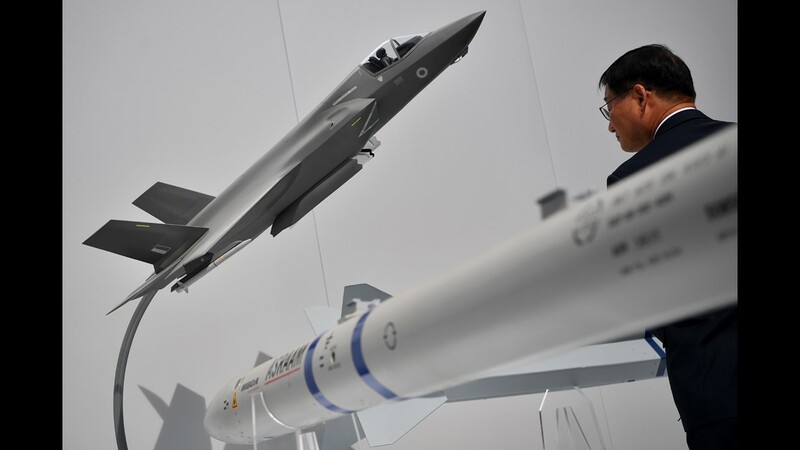 An MBDA Storm Shadow/Scalp (left) and a MARTE ER missile at the Farnborough Airshow on July 17, 2018. 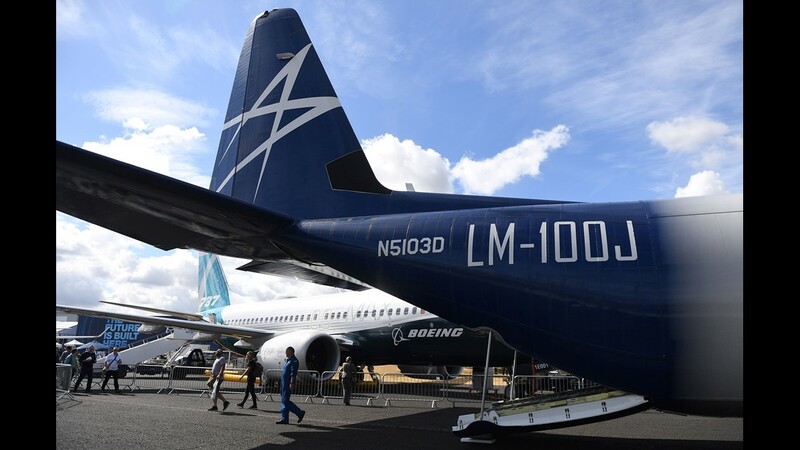 The tail of a Lockheed Martin LM-100J transport plane is seen on display at the Farnborough International Airshow on July 17, 2018. 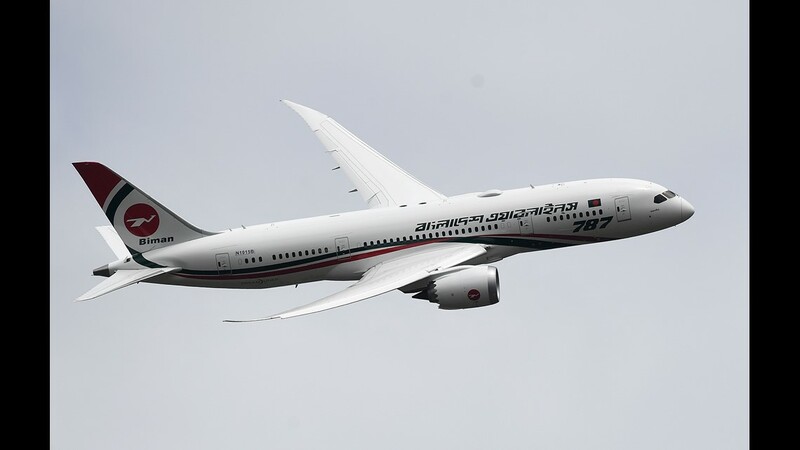 A Boeing B787-8 'Dreamliner' of Biman Bangladesh Airlines flies during a display flight at the Farnborough International Airshow on July 17, 2018. 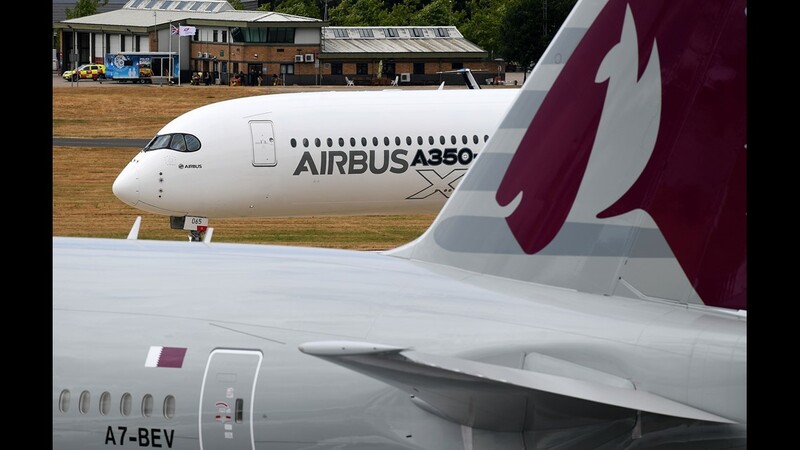 An Airbus A350-1000 XWB taxis behind a Boeing 777-300 of Qatar Airways (front) during the show's flight program at the Farnborough International Airshow on July 17, 2018. 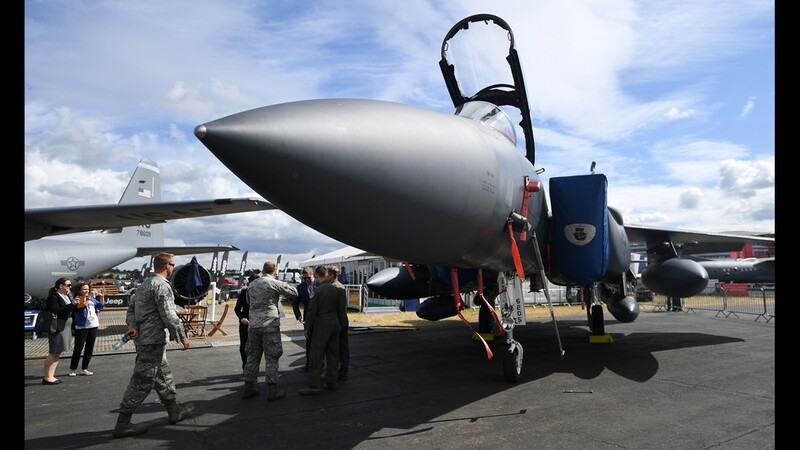 A visitor looks at a model of an F-35 fighter jet at the Farnborough Airshow on July 17, 2018. 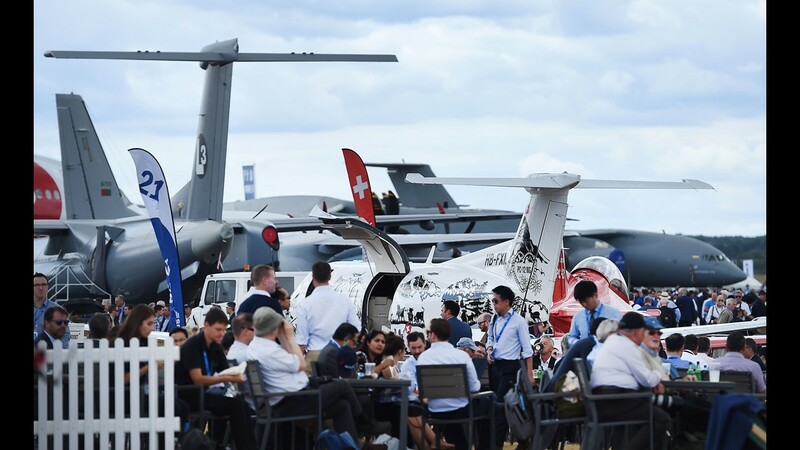 Visitors rest at near an outdoor display at the Farnborough International Airshow on July 17, 2018. 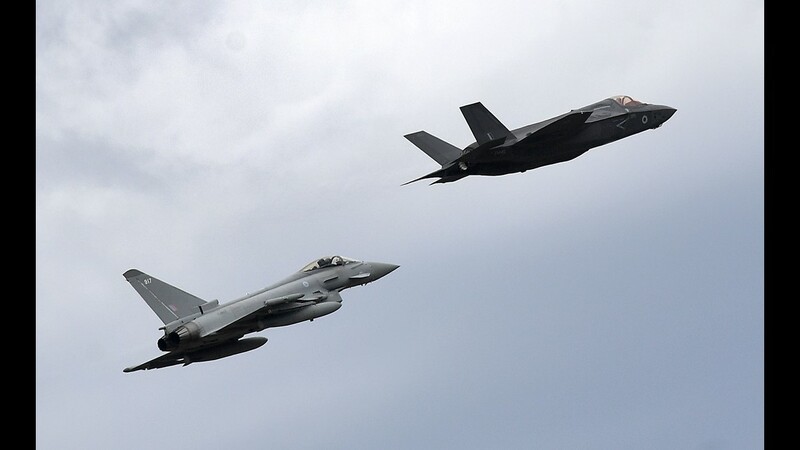 A U.S.-made Lockheed Martin F-35 Lightning (right) and a Eurofighter Typhoon (left) fly by during the flight show program at the Farnborough International Airshow on July 17, 2018. 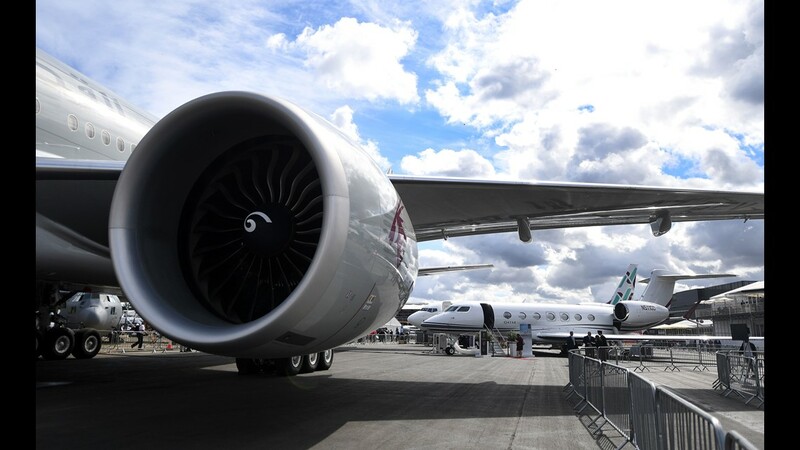 The General Electric GE90 engine of a Boeing 777 (left) is seen in front of a Gulfstrem G7 (right, background) at the Farnborough International Airshow on July 17, 2018. 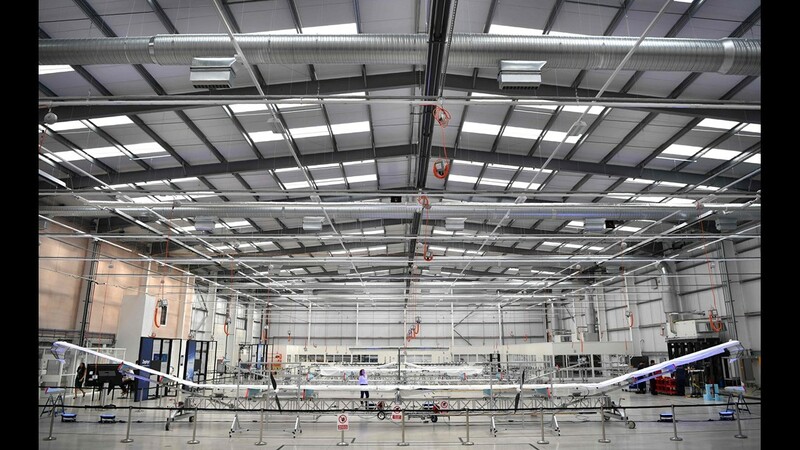 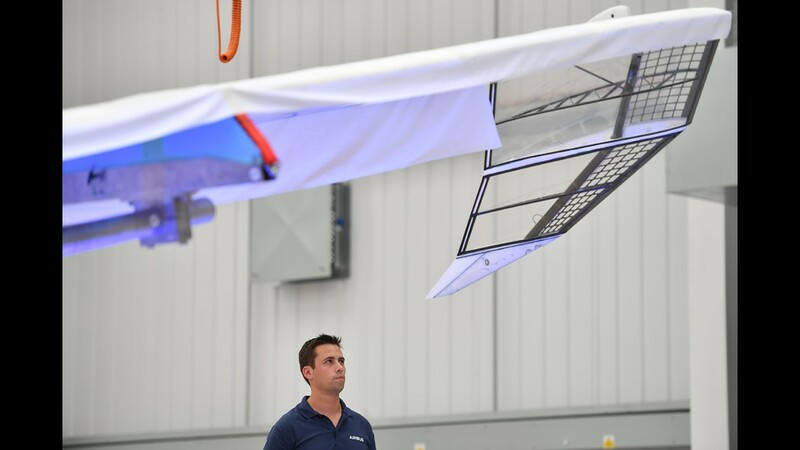 A man looks at the wing tip of an Airbus Zephyr, an High Altitude Pseudo-Satellite (HAPS) at the Farnborough Airshow on July 17, 2018. 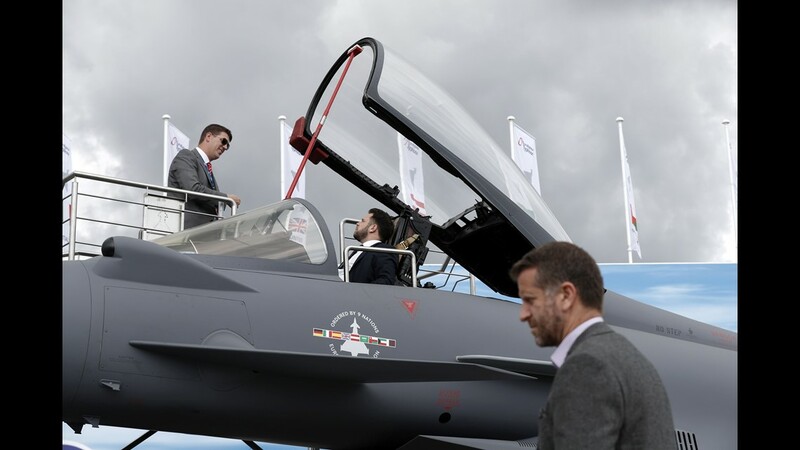 A man sits in the cockpit of a Eurofighter Typhoon aircraft at the BAE Systems exhibition space during the Farnborough Airshow on July 18, 2018. 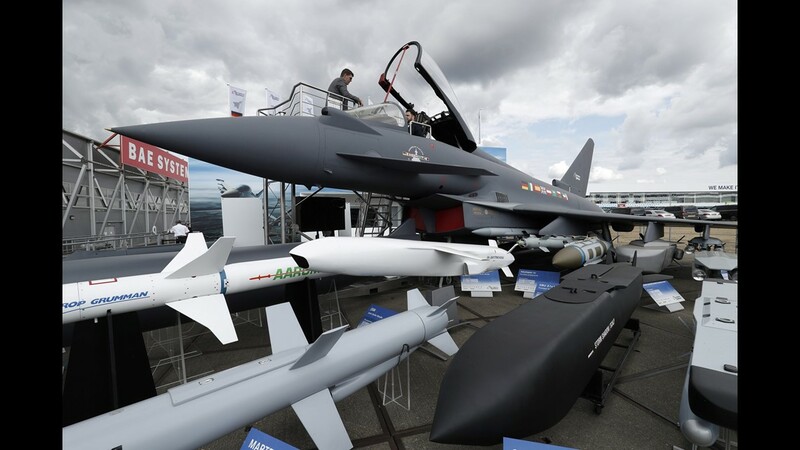 An exhibiter hands out tickets outside the Boeing exhibition space during the Farnborough Airshow on July 18, 2018. 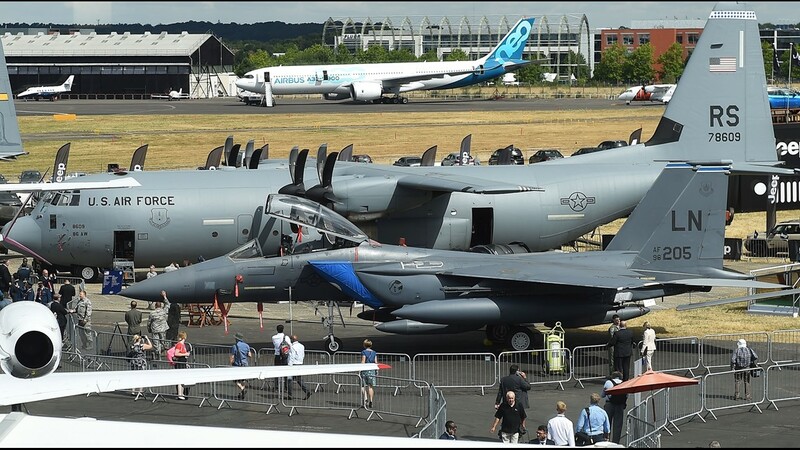 A U.S. Air Force C-130J Super Hercules military transport plane (background) and a U.S. Air Force F15e fighter jet on display at the Farnborough International Airshow on July 17, 2018. 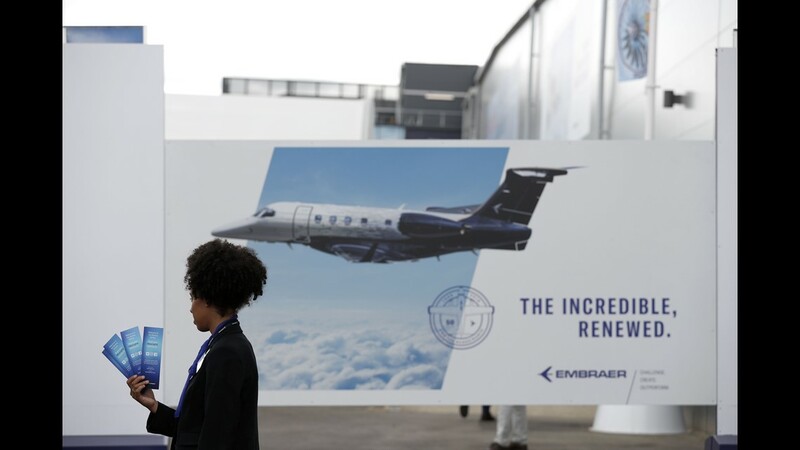 A man walks past a billboard at the Farnborough Airshow on July 18, 2018. 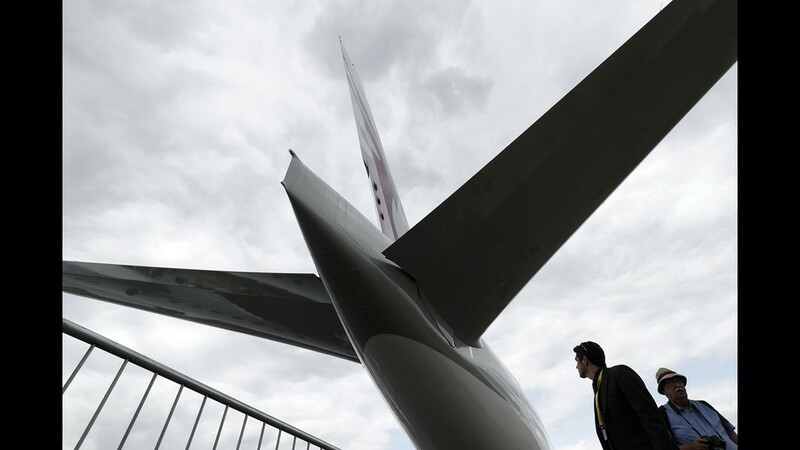 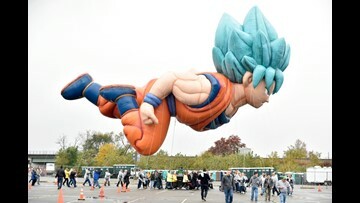 A visitor looks at an aircraft displayed at the Farnborough Airshow on July 18, 2018. 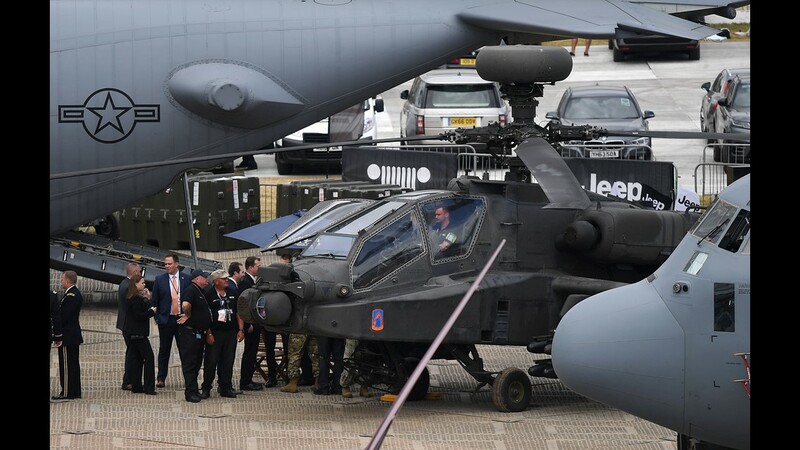 Visitors stand around a Boeing AH-64 'Apache' twin-turboshaft attack helicopter on display at the Farnborough International Airshow on July 17, 2018. 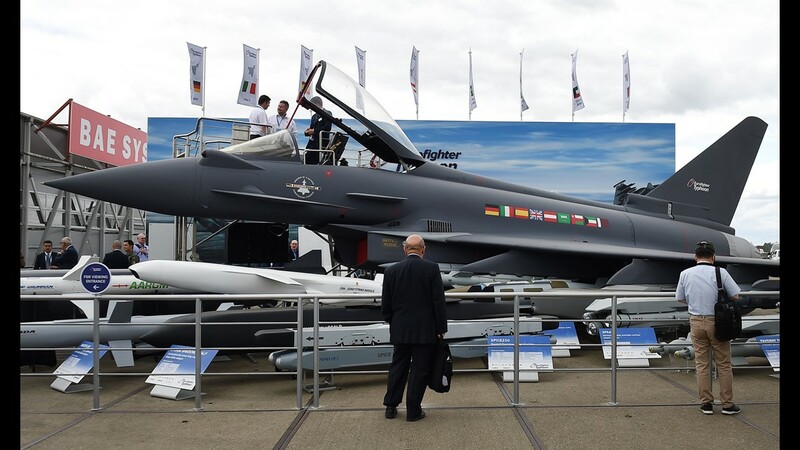 Visitors stand in front of a 'Typhoon' Eurofighter shown in the outdoor display ground at the Farnborough International Airshow on July 17, 2018. 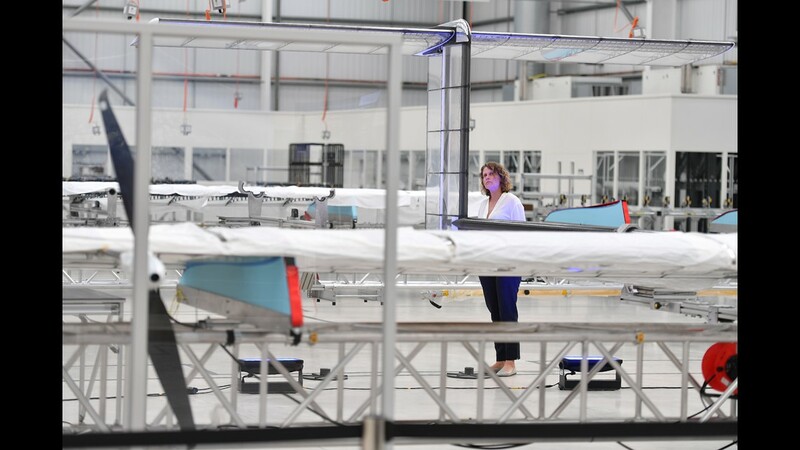 A woman looks at an Airbus Zephyr, an High Altitude Pseudo-Satellite (HAPS) at the Farnborough Airshow on July 17, 2018.